A number of astrophysical assumptions and deductions have gone unchallenged for far too long. The thermonuclear sun stands contradicted by empirical observation. Would Sir Arthur Eddington have abandoned his theory if he knew then what we know now? Over time, theories tend to cease being thought of as theoretical and begin to be thought of as unassailable, unquestionable fact. However, unquestioned fundamental assumptions will one day be science's downfall. One such theory (that has solidified into rarely questioned "fact") is the thermonuclear model of the sun. In said model, a star is a ball of gas so massive that it crushes itself under its own weight and begins to undergo fusion reactions in its core. This model traces in large part back to Sir Arthur Eddington, a British astrophysicist prominent in the early 20th century. It is not enough to provide for the external radiation of the star. We must provide for the maintenance of the high internal temperature, without which the star would collapse. - Arthur Eddington, The Internal Constitution of the Stars. No source of energy is of any avail unless it liberates energy in the deep interior of the star. ...by a process of exhaustion we are driven to conclude that the only possible source of a star's energy is subatomic; yet it must be confessed that the hypothesis shows little disposition to accommodate itself to the detailed requirements of observation, and a critic might count up a large number of 'fatal' objections. A cagey critic might point out that according to Karl Popper, it only requires one substantiated 'fatal objection' to falsify a model. Is the observable temperature profile of the sun at odds with the theoretically expected temperature profile? If so, does this constitute a direct contradiction and thus falsification of existing stellar theory? Put simply, the thermonuclear model of stars put forth by Eddington, et al requires nuclear fusion in the core of the star. That fusion liberates energy, generates extraordinarily high temperatures and thus balances the gases of a star thermally against collapse due to self-gravitation, in theory. steep temperature gradients from the core outwards. The rest of the star is heated by energy that is transferred outward from the core and the layers just outside. 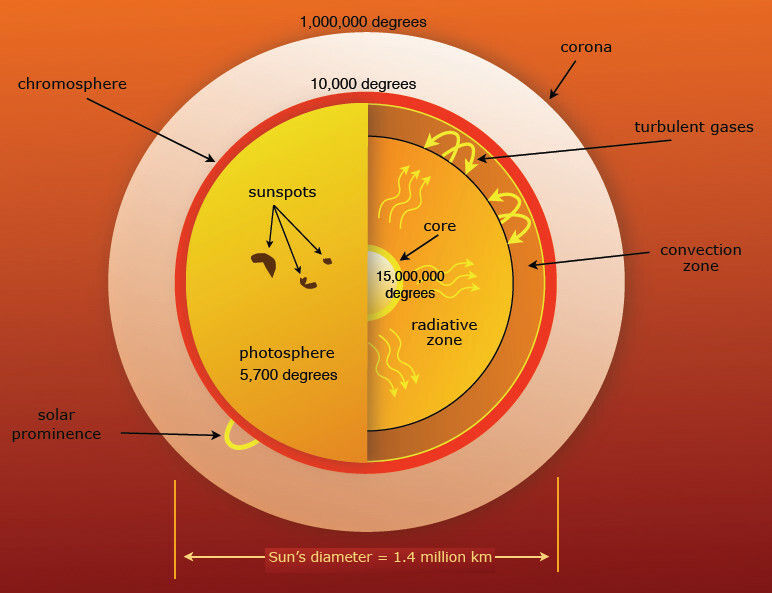 The energy produced by fusion in the core must then travel through many successive layers to the solar photosphere before it escapes into space as sunlight. The solar interior is not directly observable ... Computer modeling of the Sun is ... used as a theoretical tool to investigate its deeper layers. But do simple real-world observations back up the grandiose theories currently in vogue? Leaving aside any specific models of yore, let us objectively observe what we can of the solar atmosphere's temperature profile. There are several regions of the solar atmosphere that are directly observable to modern instruments. From the outermost to the innermost layers, they are the corona, chromosphere and photosphere, respectively. The corona's temperature is in the range of 1,000,000 - 4,000,000 Kelvin. The chromosphere's temperature is in the range of 20,000 to 1,000,000 Kelvin in the transition region just below the corona and in the range of 6,000 - 20,000 Kelvin in the lower portion of the chromosphere. The photosphere is cooler still, being approximately in the range of 4,000 - 6,000 Kelvin. The centers of sunspots, which are arguably holes punched through the photosphere, are the coolest observable portion of the sun at approximately 3,000 - 4,500 Kelvin. Sunspots are produced when vast magnetic fields push through the surface of the sun, pushing the uppermost layer of the sun's body (the photosphere) away, exposing the cooler (thus darker) solar interior. Why sunspots should reveal a darker and 'cooler' inside of the sun, when the inside of the sun is supposed to be hotter than the surface (on account of the thermonuclear furnace generating extreme temperatures which should diffuse outward), is a mystery. If sunspots open a hole to a deeper level of the sun, and deeper levels are supposed to be hotter, should not sunspots be brighter and hotter than the surrounding photosphere? That sunspots expose a darker and cooler interior appears to belie the thermonuclear sun. Put frankly, the observable temperatures of the solar atmosphere invert the theoretically expected temperature profile of the sun. Whereas the thermonuclear model of the sun expects fusion in the (extremely hot) core and a steeply declining temperature gradient extending outward, observations show precisely the opposite! The outermost layer of the sun (directly observable) is the hottest, while the innermost layer of the sun (again, directly observable) is the coolest. One wonders whether Sir Arthur Eddington would have speculated upon the thermonuclear model of stars had modern observations of temperatures in the solar atmosphere been available during his day and age. The observable temperature profile, juxtaposed with the theoretical wranglings of the thermonuclear model of the Sun and stars leads to a paradox of thermodynamic proportions! That is to say, real-world observations show the solar atmosphere to be hottest on the outside and coolest on the inside. The thermonuclear sun is expected to be hottest on the inside and coolest on the outside, in theory. If the two models are superimposed, you arrive at a contradictory state with a hot core and a hot corona and a temperature minimum at the photosphere (or possibly just below it). That appears to be precisely the predicament in which astrophysicists find themselves mired. How can such a temperature minimum be maintained between two extraordinarily hot regions? Should not heat diffuse from both adjacent hot regions into the cold region, thus warming it until it disappears completely? Essential to the received [thermonuclear sun] theory is the conviction that inside the sun is a steep temperature gradient, falling toward the photosphere, along which the internal energy flows outward. If we stack this internal temperature gradient against the observed temperature gradient in the solar atmosphere, which falls steeply inward, toward the photosphere, we find we have diagrammed a physical absurdity: The two gradients produce a trough at the photosphere, which implies that thermal energy should collect and become stuck there until it raises the temperature and eliminates the trough. That this does not occur seems to bother no one. To date, there does not appear to be any good answer as to why such a contradictory temperature minimum should exist, let alone persist, under a thermonuclear model of the sun. Its very existence would seem to be a piece of falsifying data for the thermonuclear model that spawned it. In seeking a source of energy other than contraction the first question is whether the energy to be radiated in future is now hidden in the star or whether it is being picked up continuously from outside. Suggestions have been made that the impact of meteoric matter provides the heat, or that there is some subtle radiation traversing space which the star picks up. Sir Arthur Eddington chose the former path, believing that stars harbor internally the vast majority of the energy that they expend over their lifetimes. He dismissed, seemingly without prejudice or much further thought, the alternative. ...suppose we remove the hypothetical internal temperature gradient. What then? Why then we see that the sun's bloated atmosphere and the "wrong-way" temperature gradient in that atmosphere point strongly to an external source of solar energy. Perhaps Eddington took the garden path when conjecturing the internal thermonuclear furnace as that which makes the stars shine. Is it possible that “some subtle radiation traversing space, which the stars pick up” is responsible for keeping them alight instead? Rethinking the energy source for the sun and stars may end up having far-reaching implications for astronomy and cosmology. Perhaps it's time to rethink some foundational assumptions underlying modern astrophysical theories and see what shakes loose in the light of current observations.